One of the best climbing vines on the market. 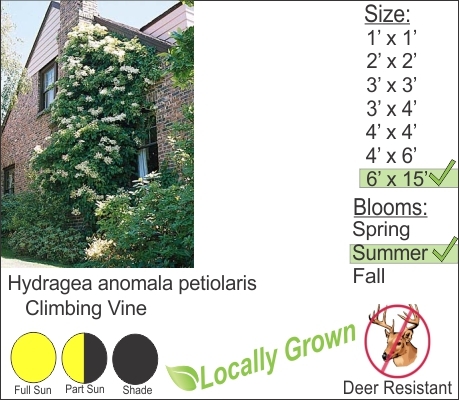 Climbing Hydrangea have a graceful branching habit that grows at a moderate rate. This vine is safe for planting on wood and stone structures. Fun Fact: The vine actually attaches itself by secreting calcium deposits. This is a safe form of attachment to buildings and other structures and does not destroy the masonry or brick homes. Climbing Hydrangea has a beautiful display of snow white flowers in the summer. You can also grow this vine on tree trunks and it is easy to maintain.